Kurz Industrial Solutions Variable Speed Drive (VFD) offering includes both low voltage AC drives and medium voltage AC drives. 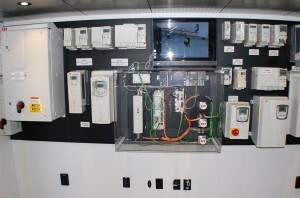 Kurz VFD product lines have approval around the globe and include ABB, Emerson and Siemens. These drive lines are known to provide years of service, even in the most extreme high cycle, high inertia industrial environments. Today’s VFD’s have a broad range of options, thus our drive engineer specialists, outside sales and inside sales professionals, are all available to help you with your selection and for post-sales support. Kurz’s onsite service team can help troubleshoot your existing drive, or integrate an upgraded drive package. Kurz VFD drive specialists are trained in both advanced programming and a large range of communication protocols for automated systems as well.